The Columbus Lions organization is pleased to announce that they have come to terms with cornerback Demario Donnell for the 2019 NAL season. 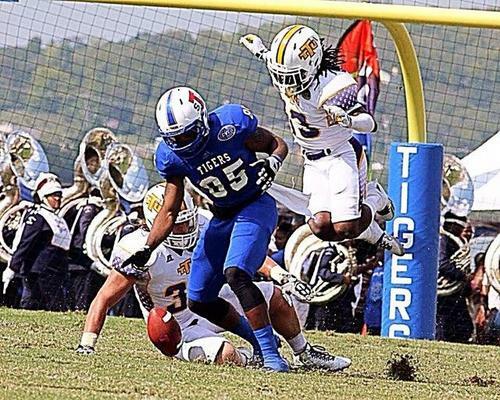 Donnell (5'9, 180 - Tennessee Tech University) is the latest addition to a Columbus Lions secondary that is traditionally known for its speed and ball hawking ability. Donnell is a veteran to the indoor game, and looks forward to stepping up to a higher competition level in the NAL after spending two years with the Amarillo Venom of the CIF. Last year, Donnell dominated the league, en route to 1st-team All-Conference and All-CIF selection. Donnell's stats certainly back up his accolades, as he finished the 2018 season with 6 interceptions, 10 PBU's, 48 tackles, and 2 fumble recoveries. Prior his professional career, Donnell starred collegiately at Tennessee Tech University, where he was a four year starter for the Golden Eagles. While in college, he was known for his speed, pass coverage ability, and willingness to tackle as he finished his career with 132 tackles, 16 PBU's, 4 forced fumbles, and an interception. Prior to his collegiate career, Donnell was a ranked recruit in the state of Tennessee while playing at Pearl-Cohn High School in Nashville, TN. Check in to see who the next roster additions will be as the Lions continue to build the 2019 roster in search of their 3rd straight NAL championship appearance!